SAN JOSE, CA--(Marketwire - January 25, 2011) - Cirtas Systems, the first company to make cloud storage work like onsite enterprise storage, announced today that it has closed a Series B funding round totaling $22.5 million, led by Shasta Ventures and Bessemer Venture Partners, along with returning first round investors NEA, Lightspeed Venture Partners and Amazon; Ravi Mohan of Shasta Ventures will take a seat on the company's board of directors. Cirtas, which has raised a total of $32.5 million in funding to date, plans to devote the new capital to support the increasing market demand for its Bluejet Cloud Storage Controller technology. Details of Cirtas' Series B funding come concurrent with the news that Gary Messiana has been appointed chief executive officer for the company, the topic of a separate announcement issued today. Cirtas launched its flagship product, the Bluejet Cloud Storage Controller, in September 2010, to enable enterprise organizations to take advantage of the proven savings of the cloud while maintaining stringent performance and security requirements. Bluejet integrates with leading cloud storage providers Amazon S3, Iron Mountain, EMC Atmos, and AT&T Synaptic Storage as a Service(SM), to provide medium to large enterprise customers with a secure, affordable and highly available storage solution for primary Tier 2 and Tier 3 data, as well as the backup and recovery of primary data stored on local storage arrays. "Continued data growth and the need to architect robust backup and disaster recovery systems have been a significant cost drain on enterprise IT for years. Cirtas' Bluejet Cloud Storage Controller technology leverages the power of the cloud to ease that pain and solve real world enterprise data center challenges while dramatically lowering the cost and complexity of data storage and protection," said Gary Messiana, CEO for Cirtas Systems. "Backed by NEA and Lightspeed, two of Silicon Valley's most respected investment firms, and Amazon, the world's leading cloud services provider, Cirtas was poised for success out of the gate. Now, with Shasta and Bessemer also on board and our product's unique value proposition validated in the marketplace, we're well positioned to execute on an aggressive roadmap of business expansion and product innovation." "Cirtas is going after a massive market opportunity and possesses a strong leadership team led by Gary Messiana -- two integral elements we look for in a potential investment company," said Ravi Mohan, a managing director at Shasta Ventures. "We were especially impressed by the progress Cirtas' founding team has made to date. They have architected a sophisticated solution, attracted brand name enterprise customers and channel partners in a relatively short period of time, and positioned the company for success. It's an exciting phase in Cirtas' development and we look forward to contributing to its future growth trajectory." "Cirtas has delivered a breakthrough enterprise-caliber storage product. Bessemer invests in market-leading companies with proven products, and after an examination of the entire cloud storage landscape, we chose Cirtas because of the product architecture, the excitement of their installed customer base and the executive team's ability to execute," said Felda Hardymon, a senior partner at Bessemer Venture Partners. "We are pleased to support Cirtas as they continue to leverage the power of cloud storage to change the way enterprise organizations protect and store their information." Cirtas solves the challenges associated with storing data in the cloud, making cloud storage work like onsite enterprise storage arrays. Deployed in the data center, Cirtas Bluejet Cloud Storage Controllers simplify storage management and vastly reduce data storage TCO, while addressing the long-standing challenges associated with data backup and disaster recovery for medium and large enterprises. Cirtas supports a variety of cloud provider platforms, including Amazon S3, Iron Mountain, EMC Atmos and AT&T Synaptic Storage as a Service(SM). Founded in 2008, the company is headquartered in San Jose, California and backed by Amazon, Bessemer Venture Partners, Lightspeed Venture Partners, NEA, and Shasta Ventures. For more information, visit www.cirtas.com. Connect with Cirtas: read the blog: www.cirtas.com/blog, follow on Twitter: www.twitter.com/Cirtas, or visit on Facebook: www.facebook.com/Cirtas. 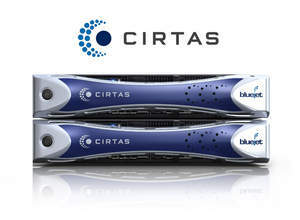 Cirtas and Bluejet Cloud Controller are trademarks of Cirtas Systems Inc. and may be registered in some jurisdictions. All other trade names or trademarks used herein are recognized to be the property of their respective owners. All rights reserved. About this company Cirtas Systems, Inc.
Cirtas solves the challenges associated with storing data in the cloud, making cloud storage work like onsite enterprise storage arrays. Cirtas, which has raised a total of $32.5 million in funding to date, plans to devote the new capital to support the increasing market demand for its Bluejet Cloud Storage Controller technology.